Understand how data moves from ServiceTrade to QuickBooks. This document covers terms related to sync settings encountered when integrating with QuickBooks, and how ServiceTrade data flows into QuickBooks. The data type mapping details may be of interest primarily to accounting and data admin persons. Pro-forma invoices are created in ServiceTrade and submitted to QuickBooks. We will attempt to match with your existing customers and items when creating an invoice in QuickBooks. If no match for a customer or item is found, we will create it in QuickBooks (exactly what happens here is configurable in your settings). It is important to understand that there is not a full, two-way, and ongoing sync occurring between ServiceTrade and QuickBooks. Data exports from QuickBooks is bulk imported usually as a one-time event during your ServiceTrade setup process. Additional bulk imports into ServiceTrade may be performed on a periodic or special event basis, but are a manual, human-initiated process, not a sync. A primary example of this is a full item list import to update pricing only. After the initial import of your data into ServiceTrade we recommend that ServiceTrade be your starting point going forward, for all new customers, items, locations, etc. Global settings for the QuickBooks integration are configured in your ServiceTrade account. These settings affect all invoices sent from ServiceTrade. To configure these settings, go to account settings in ServiceTrade, then click the "integrations" bar. It will expand. Find QuickBooks and click its button to edit settings. This is related to when a new item (not in QuickBooks) is added to Servicetrade and is created in QuickBooks during a Sync. (This is not a setting related to a customer). If you send an invoice to QuickBooks that has a new item in it, the item will be created using the Revenue and Expense info you place in the first 2 dropdowns. 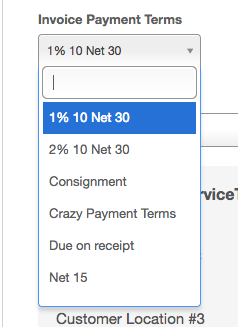 This will be the default payment term setting that ServiceTrade uses when creating a new customer. If a customer is created in ServiceTrade and does not exist in QuickBooks, the payment terms in the dropdown will be used for that customer. This can also be changed after the fact. 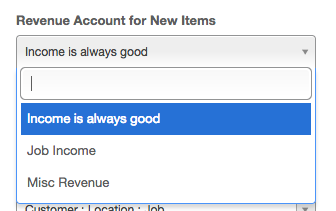 This setting needs to be the best match for how you have your customers arranged in QuickBooks. 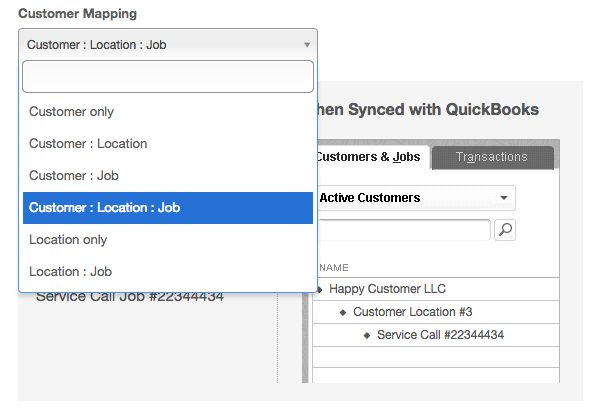 There are 6 different options for how ServiceTrade customer will map into QuickBooks, depending on your own preferences. A sample view is below. To experiment with the options and to see how the data will change in QuickBooks, log in to ServiceTrade and head to Account Settings -> Integrations -> QuickBooks. This setting will allow you to to choose whether the ServiceTrade invoice passes over to the resulting Quickbooks synced invoice or whether the synced invoice should use the next Quickbooks invoice number. If you choose "Set By Quickbooks" The synced invoice in Quickbooks will automatically get the next Quicksbooks invoice number. If you choose "Always the ServiceTrade invoice number" then the synced invoice in Quickbooks will get the ServiceTrade invoice number. This setting will allow you to decide whether the Quickbooks invoice pulls the ServiceTrade shipping address to the "Ship to" field on the Quickbooks invoice. If you choose "Set by Quickbooks" the synced invoice in Quickbooks will have the "Ship to" address from the customer in Quickbooks as the "Ship to" on the invoice. 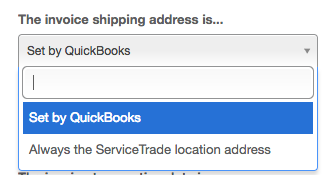 If you choose "Always the ServiceTrade Location address" the synced invoice in Quickbooks will have the Location address from ServiceTrade as the "Ship to" on the invoice. 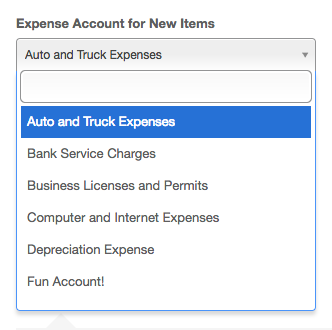 You can choose the status (in Quickbooks) of the invoices that you send to QuickBooks. 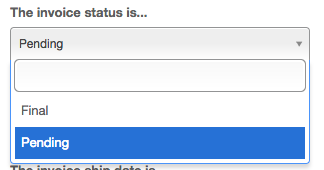 There are two options: 'Final' (the default) and 'Pending'. ServiceTrade invoice transaction date: This is the transaction date of the invoice that you can see (and edit) on the invoice page in ServiceTrade. When a new invoice is created in ServiceTrade, its transaction date is initially the day the invoice was created, but this can be changed on an invoice-by-invoice basis. ServiceTrade last appointment date: This is the date of the start time of the latest appointment that was successfully completed in ServiceTrade for this invoice's job. 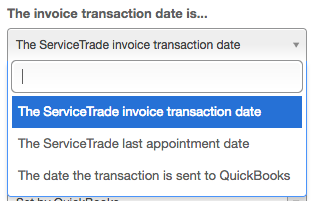 The date the transaction was sent to QuickBooks: This is the date when you clicked "Send to QuickBooks" on the invoice in ServiceTrade. The Quickbooks invoice transaction date is the date that shows on the invoice, and that the customer can see. 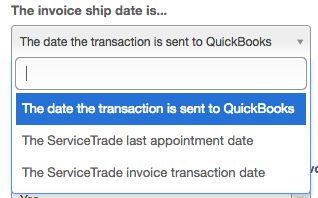 The Quickbooks invoice ship date is the date that the invoice was created (viewable in history). In some versions of Quickbooks, the invoice ship date is pulled from the sales order. Please see Intuit documentation or training resources for more information on the above differences. Set by QuickBooks: QuickBooks will use its internal rules to determine the Rep. Usually, but not always, choosing "Set by QuickBooks" will mean that the Rep field is empty. ServiceTrade job owner: The Rep on the QuickBooks invoice will be the owner of the job in ServiceTrade. You can change the job owner by going to the ServiceTrade job page and clicking "Manage Job". Technician on last ServiceTrade appointment: The Rep on the QuickBooks invoice will be the technician on the latest successfully completed appointment in ServiceTrade for this invoice's job. If that latest appointment has multiple technicians assigned to it, one technician will be arbitrarily selected. If you commonly have multiple technicians assigned to your appointments and you want to use the Rep field to help you with commissions, we recommend that you use the "ServiceTrade job owner" setting, and assign the technician that you want to receive commission for the job as that job's owner immediately before you invoice the job. IMPORTANT: If you choose "ServiceTrade job owner" or "Technician on last ServiceTrade appointment", the initials of the user in ServiceTrade must match the initials of that employee in QuickBooks. You may need to include your employee's middle initial in their name in ServiceTrade to accomplish this; for instance, if your employee's name is "John C. Smith" and their initials in QuickBooks are "JCS", you should make their first name in ServiceTrade "John C." and their last name in ServiceTrade "Smith". If the employee record in QuickBooks can't be found (for instance, if there is no employee record whose initials correspond to the ServiceTrade user's initials), no Rep information will be sent to QuickBooks, and the result will be the same as if you had selected "Set by QuickBooks". Note that QuickBooks does not have a built-in way to handle split commissions (that is, multiple technicians sharing commissions for a single invoice), so if you need to handle split commissions, we recommend that you use the ServiceTrade invoice export (which includes a list of all technicians involved on each invoice's job) to compute your commissions. If you keep track of your customers' default communication preferences (print or email) in QuickBooks, you can use that information to auto-select the correct delivery method when syncing new invoices from ServiceTrade. If you choose 'Yes', the invoice's 'Print Later' checkbox will be checked if the customer's communication preference is 'Mail', and the invoice's 'Email Later' checkbox will be checked if the customer's communication preference is 'E-Mail'. If the customer's communication preference is 'None', ServiceTrade will not check either of the 'Print Later' or the 'Email Later' checkboxes on the invoice. If you choose 'No', ServiceTrade will not check either of the 'Print Later' or the 'Email Later' checkboxes on the invoice. IMPORTANT: If ServiceTrade does not check either of the communication checkboxes on an invoice (that is, if you've chosen not to use this setting, or if the customer's preference was 'None'), QuickBooks will then rely on its own internal rules in deciding whether either (or both) of these checkboxes should be checked. These are the same rules that it uses when you create an invoice manually. Item descriptions on ServiceTrade invoices correspond to descriptions in QuickBooks. The ServiceTrade item description always wins, and will be displayed on the invoice in QB. PO numbers will transfer from ServiceTrade to the PO No. field (QuickBooks Desktop) or a custom field named "PO" (QuickBooks Online). 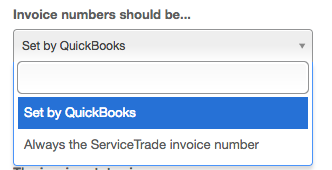 Pricing on an invoice in Quickbooks that came from ServiceTrade will always have the same pricing as on the ServiceTrade invoice. Default QuickBooks pricing is only considered when a QuickBooks user manually makes an invoice in QuickBooks. If an item has an item code in ServiceTrade, we will attempt to match with an item number in QuickBooks. If there is no item code or no match, the descriptions will be matched up. If a match is not found in QuickBooks and the ServiceTrade item has an item code, a new QuickBooks item is created. 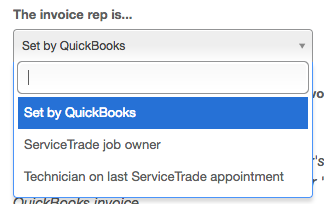 Navigate in the full ServiceTrade web app to Account Settings -> Integrations -> QuickBooks. Type in the desired mapping (such as "Misc") into the "Other Item Mapping (Optional)" field. We will map invoice items that aren't in Item mapping:your ServiceTrade standard item list to this QuickBooks item. This item must already exist in QuickBooks. If not provided, ServiceTrade will create new items in QuickBooks for each nonstandard invoice item. If you do not provide an other item mapping (which will cause new items to be created), all newly created items will be Non-inventory items. 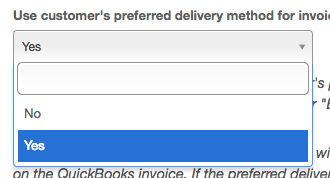 If you provide an Quickbooks item name that does not exist in Quickbooks, the invoice will fail. (You may intentionally cause this to happen if, for instance, you never want items that don't already exist in Quickkooks to be used on your invoices. In this case, you should provide an item ID such as 'BOGUS' or 'FAKEITEM' that does not exist in Quickbooks). 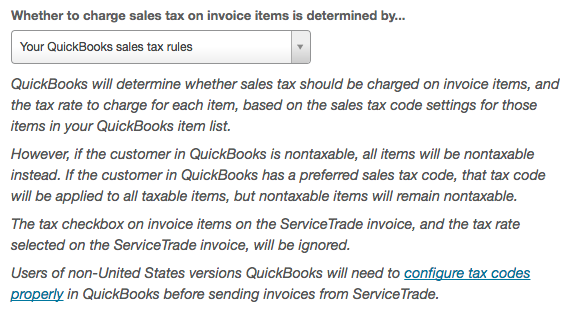 If you choose "Your QuickBooks sales tax rules", no information about sales tax will be sent to QuickBooks. QuickBooks will determine whether sales tax should be charged on invoice items, and the tax rate to charge for each item, based on the sales tax code settings for those items in your QuickBooks item list. QuickBooks will determine whether tax should be charged on the entire invoice based on the sales tax settings for the customer in QuickBooks. The tax checkbox on invoice items on the ServiceTrade invoice, and the tax rate selected on the ServiceTrade invoice, will be ignored. If you choose "The ServiceTrade invoice", QuickBooks will charge sales tax on invoice items which were marked as taxable on the ServiceTrade invoice. QuickBooks will still determine the tax rate to charge for each item, based on your sales tax code settings for those items in your QuickBooks item list. The sales tax rate selected on the ServiceTrade invoice will be ignored; however QuickBooks will treat all items as non-taxable if the ServiceTrade invoice sales tax rate is 0%. QuickBooks internal rules will decide whether tax should be charged on the entire invoice based on the sales tax settings for the customer in QuickBooks. IMPORTANT: Users of international versions of QuickBooks will need to take special steps to ensure that sales tax is handled properly on invoices sent from ServiceTrade. More details are available in this article. If company-only mapping is set in ServiceTrade, we do not send an email to Quickbooks (as we don't track email address on companies). Otherwise we use the ServiceTrade location's email address. If using location mapping and there is no ServiceTrade location email, we use the primary contact email. Primary Phone: If using company-only mapping, we send the ServiceTrade company phone number. If using location mapping, we send the ServiceTrade location phone number. If there is no ServiceTrade location phone number, we use primary contact phone. Alternate Phone: If using company mapping, we do not send anything. If using location mapping, we send the company phone number. Quickbooks Online - The ServiceTrade invoices notes will be displayed as invoice notes (visible if printing/emailing the invoice). Quickbooks Desktop - The ServiceTrade invoice notes will be displayed as invoice memos (not visible if printing/emailing the invoice).